So, an exfoliation is a must! COST: INR 130 for 100gms; INR 70 for 50gms. HIMALAYA HERBALS , Purifying Neem Scrub, with Anti bacterial properties. Exfoliates and purifies for clear, problem free skin. Specially formulated to give you clear, problem free skin, this scrub works with a dual exfoliation and purifying action. Neem, well-known for its Purifying and anti bacterial properties, kills problem causing bacteria. Combined with exfoliating Apricot granules, it gently scrubs away blackheads, dead skin cells and embedded impurities, leaving your skin, soft, clear, refreshed and problem free. Each gram contains: Exts. Nimba(azadirachta indica) lf 50mg, haridra(curcuma longa) rz. 5mg, pdr. Urumana(prunus armeniaca) sd. 5mg. Methylparaben ip, propylparaben ip, phenoxyethanol ip. DIRECTIONS: Moisten face and neck and apply, avoiding area around eyes. Massage gently with finger tips in a circular motion for a minute. Wash off and pat dry. Use 2-3 times weekly. For best results, also use Purifying Neem face wash and Purifying Neem face pack. 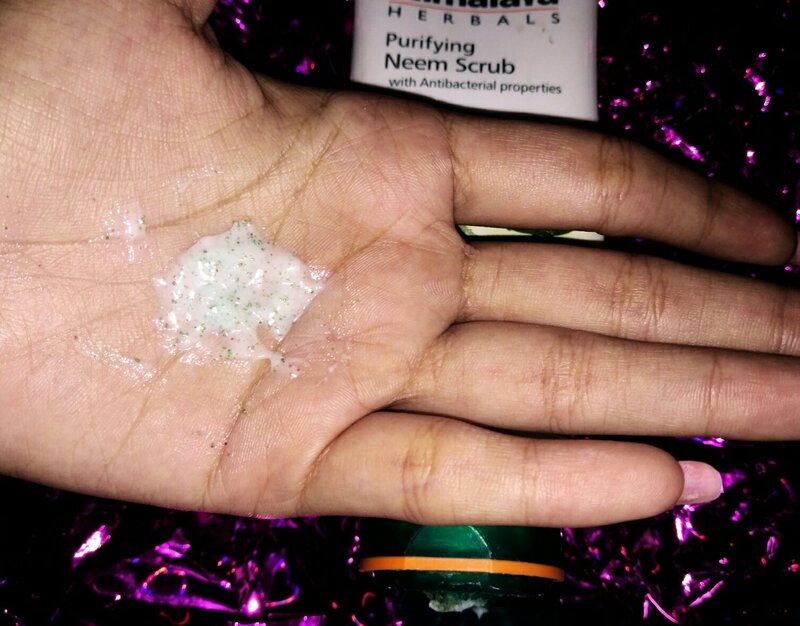 Now as far as the working is concerned, It is a pretty decent scrub and scrubs off all the dead skin cells, providing a healthy glow to the face but apart from that I couldn’t find it being actually helpful for my acne or blackheads..
2. Scrubs off dead cells effectively. 3. After using the scrub the skin feels clear, bright and refreshing. 4. Quite gentle on skin; won’t break you out. 2. Doesn’t help considerably with blackheads or acne. 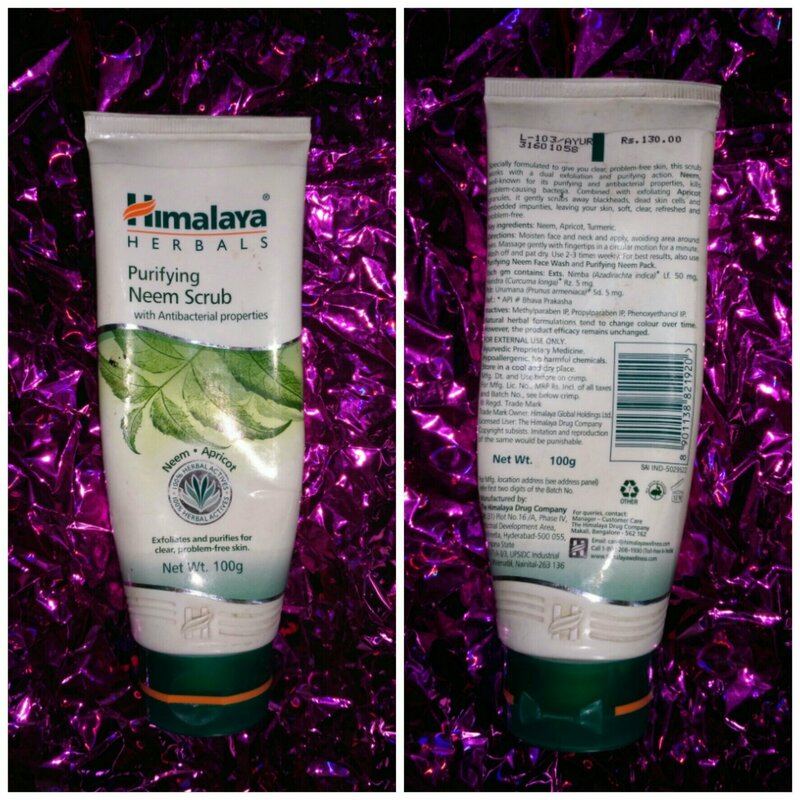 I am a big fan of Himalaya brand and tried this scrub long back, it’s good. I used to use this face scrub earlier.. It is an average product as you said.. Paraben is the big concern. Oh, yes! Paraben is a big concern! I have oily skin. I will buy this today. 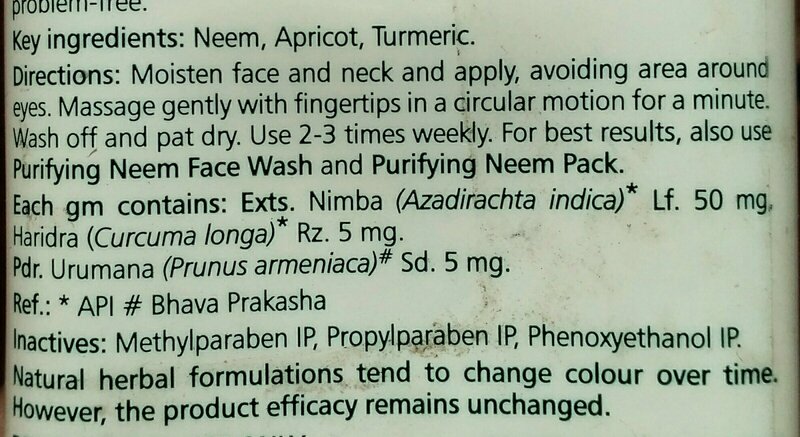 I use Himalayan Neem face pack n it works wonders for me but I have normal skin. Will try the scrub now buddy. Himalaya neem products are quite good! Bang on lovely, this is my all time favorite but along with being favourite, I wish itbwas more natural and had no parabens. I love love love Himalaya. And I have used their need face pack. I am gonna use face scrub now after reading your review. I I have used this product. Basically its not a strong scruber atleast not in my case. I need something with more exfoliates. But its good if you use it as a normal face wash on daily basis. Thanks for sharing an honest feedback. I like the fact that it is decently priced and is good for all skin types. Himalaya products will always be my favourite. It has a long legacy. I like products without Paraben. Thanks fr sharing the cons too. Thanks for the honest review , haven’t tried it yet but will avoid since it has paraben. Himalayas is must have at my vanity, and I trust this brand from the core. This particular scrub has wonderful results on my skin. Thanks for sharing pros and cons. I have whiteheads and nothing helps except cleansing tools. I wish this scrub didn’t had parabens. Parabens are a big issue!